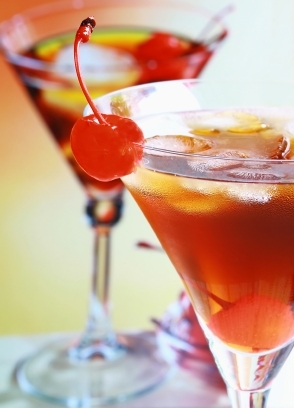 Serving cocktails to your bar's customers is a great way to increase the profits of your bar. Because cocktails use a variety of liquors and liqueurs, the cost of these drinks is much higher than the cost of draft beer or wine. However, many customers grow tired of drinking the same cocktails over and over again. If your customers need something new, you can try offering any of these four obscure cocktails for added variety in your bar. This interesting cocktail is a great addition to your bar's menu options. The unexpected flavors in this obscure cocktail will delight even the most seasoned cocktail aficionado. Just in time for Halloween, the key ingredient in this cocktail is Tabasco sauce, which is almost unheard of in a sweet cocktail. To make The Bone cocktail, mix bourbon whiskey with lime juice and simple syrup. Before serving, however, add several dashes of Tabasco sauce to the cocktail. You can stir the drink before giving it to the customer, or leave the red drops of Tabasco suspended in the drink for a creative, slightly gory, appearance. Most consumers don't realize that liqueurs come in a variety of floral flavors as well as the common fruit flavors familiar to most cocktail drinkers. One of the most obscure liqueurs that makes a great addition to any cocktail is lavender liqueur. With subtle flavors of vanilla and lemon, mixed with lavender, this floral liqueur is sultry and romantic. The lavender aroma is great when paired with soda and simple syrup. The aromatic herbs and spices used in Allspice Dram pair beautifully with different mixers for a delectably savory seasonal cocktail. Because the aromas of clove and cinnamon are common in holiday pies, mixing Allspice Dram with lime juice, simple syrup, and bitters makes a delicious cocktail that may be completely new to many of your customers. You can offer this cocktail throughout the year or feature it only during the winter holidays. James Bond fans will recall the famous beverage created by the fictional superspy known as the Vesper. However, it is impossible to make a true Vesper these days because the sharp wine known as Kina, which was used in the original drink, is no longer available. If you want to serve a Vesper that is as true to form as possible, try using Cocchi Americano. Cocchi Americano is an aromatic wine that is infused with flavors from cloves, herbs, spices, and fruit juices. You'll be the only bar on your block offering the same beverage that Bond sipped in all his fictional glory. Cocktails don’t have to be boring or unoriginal. While many customers will order the same comforting cocktails over and over, you will have many customers who like to be adventurous in their drink selection. Adding obscure cocktails to your menu will provide some entertainment and excitement for these customers. You can even make your own cocktails. Just combine all of the flavors you love in varying proportions until you achieve the perfect cocktail recipe. The best cocktails are a combination of brilliant flavor and powerful effect.